Yes, the house looks fabulous! We are so happy with the color. Our home looks brand new and so much bigger. Wow! We love our house again! Cannot say enough…the house looks great! So glad to get rid of those old, drafty windows and the stucco and stone work is a wonderful change for the ugly siding we had. Why did we wait so long? And, the guys doing the stucco work and window installation were AWESOME! Thank you Jeanne for all your wonderful suggestions – your attention to detail and excellent product knowledge left us with an overall wonderful customer experience after talking to so many other less than professional sales reps in the area. Colorado Window & Door has two thumbs up from us! Nothing but positives for the quality of work and the service received. 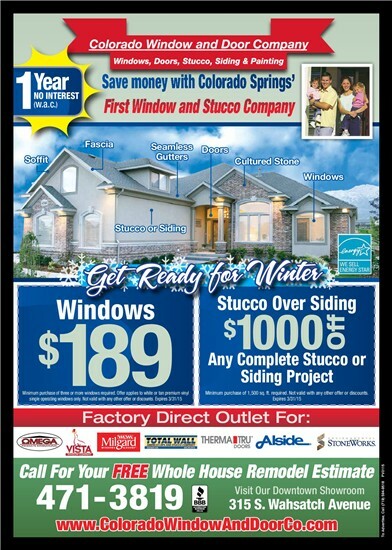 These are honest, hardworking people and I would recommend them to anyone wanting quality windows and stucco! As for the negative comments on here, I suspect they treat everyone poorly. With any home improvement project, issues can come up. When they do, call the company and calmly explain the situation. We did this, and found the response from Colorado Window & Door and our sales person to be above and beyond expectations. Thank you Jeanne, Elke and Brett! It is with pleasure that we extend our warm thank you for all your assistance in the installation of our double front doors. It was a professional team effort from the initial selection of the doors, hardware, installation and final touch-up. Throughout the process it was an enjoyable experience. The installation team was mindful of the winter weather and kept the opening of the doors to a minimum. The cleanup was an ongoing process and left the area in excellent condition. You can rest assured of only positive feedback to our friends and neighbors about the doors. You can also use us for a reference and site visit for your customers. Loved Working With This Company!! Great company to do business with!! My husband and I both wanted to basically create a ‘maintenance free’ exterior on our home-no painting, little cleaning, etc. Colorado Window and Door Company came out and replaced all of our windows with Sun Clean Glass, they replaced our gutters and installed new fascia with the color of our choosing, and hence, pre finished color, NO MORE PAINTING!!! They stuccoed our entire home, including the soffit, which we absolutely love!!!! Our sales gal and the entire four crews that came out to work on our home were friendly, clean and did such wonderful work. We are so happy to have found a company that could help us with all of our needs. The work flowed….first the windows and doors, then right after, the stucco started, then the new fascia and gutters. Sales people, office staff and the crews did an exceptional job! …In 2005, Colorado Window and Door replaced the windows and patio door in my home, including a 10’x6′ single pane picture window that they converted to a strikingly beautiful 5-light bow window with two vertical crank-out casements. They created a solution that gave me ventilation in the summer and warmth in the winter all wrapped up in a design that enhances the beauty of my home. Recently, an issue developed with the casements in this very large window. After having a factory rep evaluate the window, Colorado Window and Door sent out a crew who developed a solution that not only corrected and supported the window but also kept the aesthetic beauty of the window and my home intact.